Cedar Spring Family Dentistry can handle all of your family’s general dental and oral care needs. We serve patients of all ages, including children. We work hard to ensure our office is a fun, stress-free and welcoming environment, so children (and adults!) of all ages feel comfortable. Our two dentists, Dr. Derek Herring and Dr. Steven Richards, and our team of registered dental hygienists and assistants have experience in caring for even the littlest teeth and gums. Children’s preventative dental care: Our dentists will check for cavities or other issues before they become problems. If needed, we’ll take x-rays to follow teeth formation, ensure teeth are developing properly, and detect cavities and other potential problems. Oral health education: Our dental hygienists lovingly teach children about good dental care, brushing techniques, flossing, and the importance of keeping teeth healthy. We offer toothbrushes and toys to keep kids excited and motivated to start and keep good dental hygiene habits. Kids’ teeth cleaning: We offer children of all ages a full cleaning of teeth and gums, using kid-approved toothpaste flavors, all while keeping kids calm and comfortable throughout. They can relax while watching their favorite shows on TV during the entire procedure. We recommend a full cleaning and check-up every 6 months. If you’re looking for a dental office in Spartanburg that can treat every member of your family, [OR YOU] want a dentist who’s great with kids, then look no further than Cedar Spring Family Dentistry. 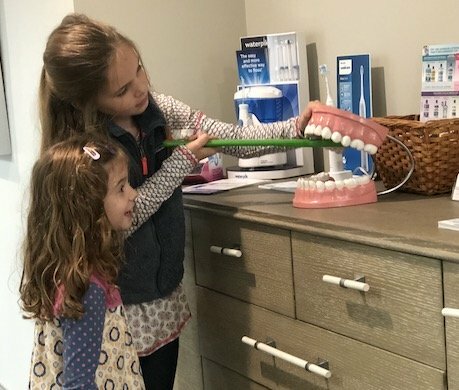 We look forward to developing the type of relationship where we can guide children from their first dental visit through adulthood, without them ever experiencing fear or worrying about the dentist. We know the importance of starting good dental habits early, and we’re happy to be your partner in teaching these habits to your children. We are now accepting new patients, and we’d be honored to be the new dental home for your family. Contact us now for your first appointment.